You could see the impact of low socioeconomic status on health in my community. Dr. Brad Johnson did exactly what you’d hope: he found a community with a shortage of doctors and moved there to fill the need. His family practice, in partnership with Dr. John Pearce, opened on August 21, 2018, in a busy plaza in Simcoe, Ontario. The town is in Norfolk, a county that is designated medically underserved by the province. He quickly took on 1,400 patients, many from the nearby Six Nations Reserve where he grew up. Brad’s family is Oneida and many of them still live and work in the Six Nations community about 30 minutes north-east of the Donly Drive office. 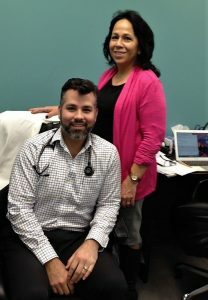 “I wanted to help people,” he says of his decision to become a family doctor. His mother, Donna Johnson, played a huge role in the life of her four sons, who were schooled at home through their final year of high school. Brad, 30, completed an undergraduate medical degree at McMaster University and family medicine residency through McMaster’s Grand Erie Six Nations campus, with rotations at Brantford General Hospital, among others. “All our patients deserve culturally competent, safe care,” he says. Family remains central to his life, which now includes wife, Lydia, and son, Wesley, 3. Teacher Donna is hard at work on a computer beside his desk, helping to manage her son’s office, “a full-time job these days,” she says. His father, Ray Johnson, is a pastor. Brad and Lydia met in a church, after Brad performed on keyboard and violin during a concert with his Gospel band. They plan to raise Wesley in the community of their own church in Simcoe.